Like human patients, mice with a form of Duchenne muscular dystrophy undergo progressive muscle degeneration and accumulate connective tissue as they age. Now, researchers at the Stanford University School of Medicine have found that the fault may lie at least partly in the stem cells that surround the muscle fibres. They've found that during the course of the disease, the stem cells become less able to make new muscle and instead begin to express genes involved in the formation of connective tissue. Excess connective tissue – a condition called fibrosis – can accumulate in many organs, including the lungs, liver and heart, in many different disorders. In the skeletal muscles of people with muscular dystrophy, the fibrotic tissue impairs the function of the muscle fibres and leads to increasing weakness and stiffness, which are hallmarks of the disease. The researchers discovered that this abnormal change in stem cells could be inhibited in laboratory mice by giving the animals a drug that is already approved for use in humans. The drug works by blocking a signalling pathway involved in the development of fibrosis. Although much more research is needed, the scientists are hopeful that a similar approach may one day work in children with muscular dystrophy. 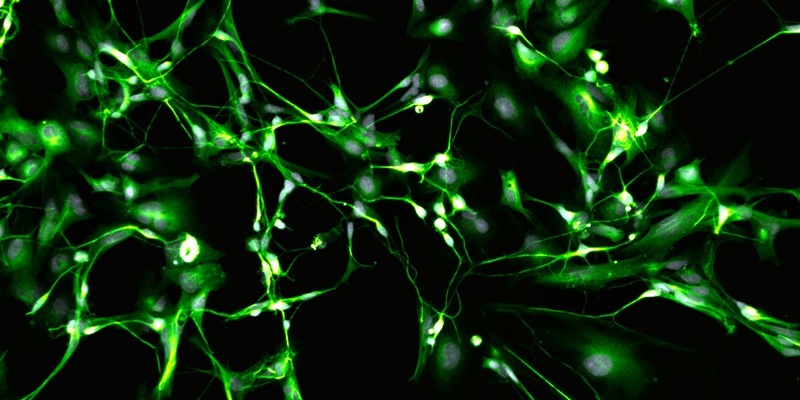 "These cells are losing their ability to produce muscle, and are beginning to look more like fibroblasts, which secrete connective tissue," said Thomas Rando, MD, PhD, professor of neurology and neurological sciences. "It's possible that if we could prevent this transition in the muscle stem cells, we could slow or ameliorate the fibrosis seen in muscular dystrophy in humans." A paper describing the researchers' findings will be published Dec. 17 in Science Translational Medicine. Rando, the paper's senior author, is director of the Glenn Laboratories for the Biology of Aging and founding director of the Muscular Dystrophy Association Clinic at Stanford. Former postdoctoral scholar Stefano Biressi, PhD, is the lead author. Biressi is now at the Centre for Integrative Biology at the University of Trento in Italy. The researchers found that the expression of myogenic genes, which are associated with the regeneration of muscle in response to injury, was nearly completely lacking in many of the muscle stem cells in the mice after just 11 months, while the expression of fibrotic genes had increased compared with that of control animals. The cells from the dystrophic animals were also oddly located: Rather than being nestled next to the muscle fibres, they had begun to move away into the spaces between tissues. Rando and Biressi knew that a similar, but much less pronounced, accumulation of connective tissue in muscle fibres occurs during normal aging. That process is governed by signalling proteins, which include the Wnt and TGF-beta protein families. 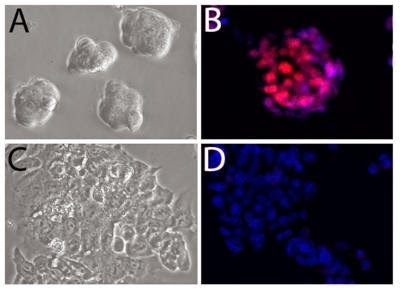 Wnt plays a critical role in embryonic development and cancer; TGF-beta controls cell division and specialization. They wondered whether blocking the Wnt/TGF-beta pathway in the dystrophic mice would inhibit fibrosis in the animals' muscles. The researchers turned to a drug called losartan, which is used to treat high blood pressure. Losartan inhibits the expression of the genes for TGF-beta types 1 and 2. The researchers thought it would probably interrupt the signalling pathway that leads the muscle stem cells astray. "This scar tissue, or fibrosis, leaves the muscle less elastic and impairs muscle function," Rando said. "So we'd like to understand why it happens, and how to prevent it. It's also important to limit fibrosis to increase the likelihood of success with other possible therapies, such as cell therapy or gene therapy." Because TGF-beta type 1 plays many roles throughout the body, the researchers are now working to find ways to specifically inhibit TGF-beta type 2, which is involved in the transition of the muscle stem cells. They're also interested in learning how to translate the research to other diseases. "Fibrosis seems to occur in a vicious cycle," Rando said. "As the muscle stem cells become less able to regenerate new muscle, the tissue is less able to repair itself after damage. This leads to fibrosis, which then further impairs muscle formation. Understanding the biological basis of fibrosis could have a profound effect on many other diseases." 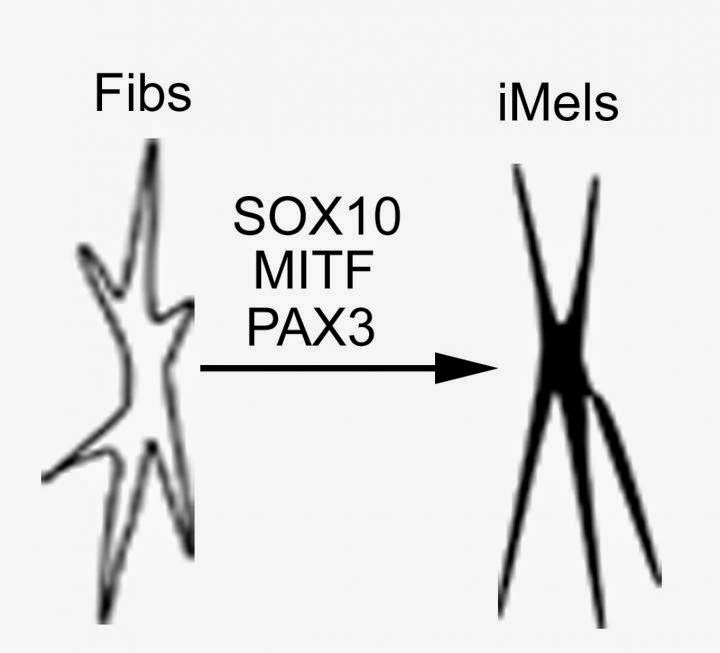 factors (SOX10, MITF and PAX3). As the main component of connective tissue in the body, fibroblasts are the most common type of cell. Taking advantage of that ready availability, scientists from the Perelman School of Medicine at the University of Pennsylvania, the Wistar Institute, Boston University School of Medicine, and New Jersey Institute of Technology have discovered a way to repurpose fibroblasts into functional melanocytes, the body's pigment-producing cells. The technique has immediate and important implications for developing new cell-based treatments for skin diseases such as vitiligo, as well as new screening strategies for melanoma. The work was published this week in Nature Communications. The new technique cuts out a cellular middleman. Study senior author Xiaowei "George" Xu, MD, PhD, an associate professor of Pathology and Laboratory Medicine, explains. "Through direct reprogramming, we do not have to go through the pluripotent stem cell stage, but directly convert fibroblasts to melanocytes. So these cells do not have tumourigenicity." Changing a cell from one type to another is hardly unusual. Nature does it all the time, most notably as cells divide and differentiate themselves into various types as an organism grows from an embryo into a fully-functional being. With stem cell therapies, medicine is learning how to tap into such cell specialization for new clinical treatments. But controlling and directing the process is challenging. It is difficult to identify the specific transcription factors needed to create a desired cell type. Also, the necessary process of first changing a cell into an induced pluripotent stem cell (iPSC) capable of differentiation, and then into the desired type, can inadvertently create tumours. "We did a huge amount of work," says Xu. "We eliminated all the combinations of the other transcription factors and found that these three are essential." The researchers first tested the SMP3 combination in mouse embryonic fibroblasts, which then quickly displayed melanocytic markers. Their next step used a human-derived SMP3 combination in human foetal dermal cells, and again melanocytes (human-induced melanocytes, or hiMels) rapidly appeared. Further testing confirmed that these hiMels indeed functioned as normal melanocytes, not only in cell culture but also in whole animals, using a hair-patch assay, in which the hiMels generated melanin pigment. The hiMels proved to be functionally identical in every respect to normal melanocytes. The method could also provide a new way to study melanoma. By generating melanocytes from the fibroblasts of melanoma patients, Xu explains: "we can screen not only to find why these patients easily develop melanoma, but possibly use their cells to screen for small compounds that can prevent melanoma from happening." Consider the relationship between an air traffic controller and a pilot. The pilot gets the passengers to their destination, but the air traffic controller decides when the plane can take off and when it must wait. The same relationship plays out at the cellular level in animals, including humans. A region of an animal's genome - the controller - directs when a particular gene - the pilot - can perform its prescribed function. "We studied how the Sox2 gene is turned on in mice, and found the region of the genome that is needed to turn the gene on in embryonic stem cells," said Professor Jennifer Mitchell of U of T's Department of Cell and Systems Biology, lead investigator of a study published in the December 15 issue of Genes & Development. "If we want to understand how genes are turned on and off, we need to know where the sequences that perform this function are located in the genome," said Mitchell. "The parts of the human genome linked to complex diseases such as heart disease, cancer and neurological disorders can often be far away from the genes they regulate, so it can be difficult to figure out which gene is being affected and ultimately causing the disease." "We then focused on the region we've since named the SCR as my work had shown that it can contact the Sox2 gene from its location 100,000 base pairs away," said study lead author Harry Zhou, a former graduate student in Mitchell's lab, now a student at U of T's Faculty of Medicine. "To contact the gene, the DNA makes a loop that brings the SCR close to the gene itself only in embryonic stem cells. Once we had a good idea that this region could be acting on the Sox2 gene, we removed the region from the genome and monitored the effect on Sox2." "Just as deletion of the Sox2 gene causes the very early embryo to die, it is likely that an abnormality in the regulatory region would also cause early embryonic death before any of the organs have even formed," said Mitchell. "It is possible that the formation of the loop needed to make contact with the Sox2 gene is an important final step in the process by which researchers practicing regenerative medicine can generate pluripotent cells from adult cells." "Though the degree to which human embryonic stem cells possess this feature is not entirely clear, by understanding how another complex organism's genome works we ultimately learn more about how our own genome works," said Zhou. Pluripotency is the ability stem cells have to turn into any one of the 226 cell types that make up the human body. The work challenges the previously accepted thought that any pluripotent human stem cell could be used to similarly generate the same amount of mature tissue cells. 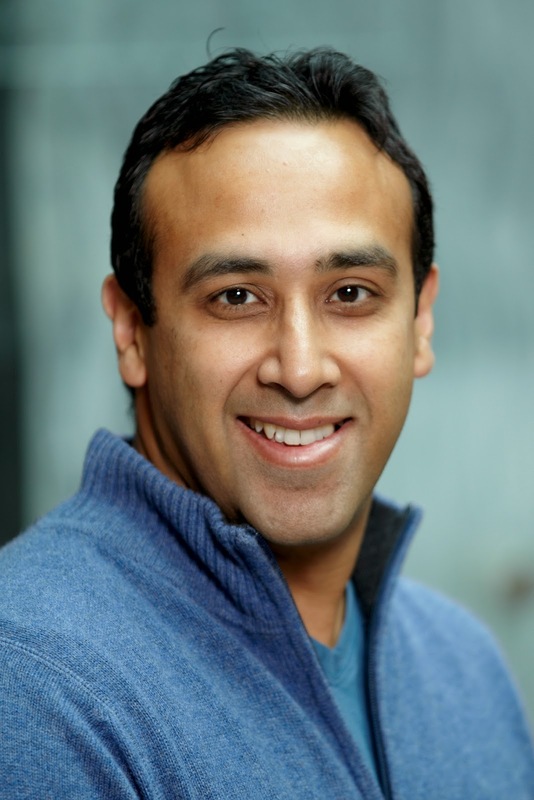 "So, not all human iPSCs are made equal," Bhatia added. 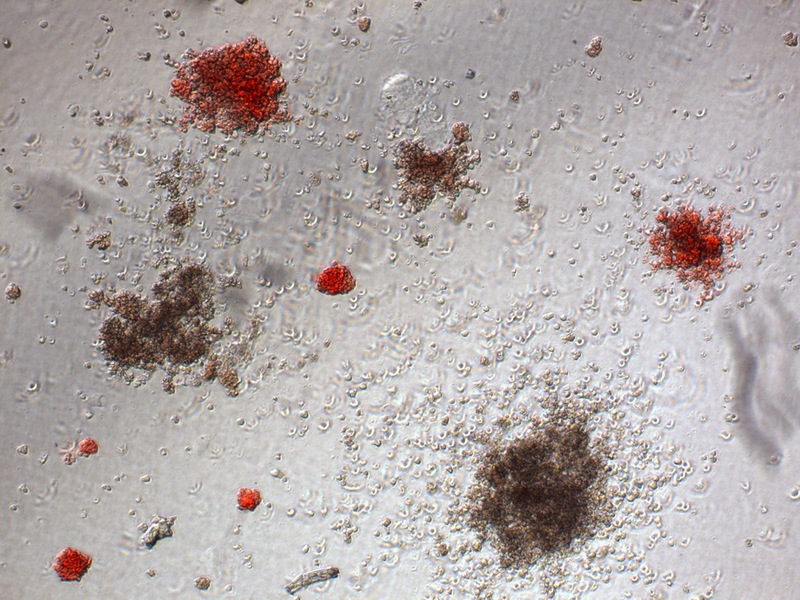 "Moving forward, this means that iPSC generation from a specific tissue requiring regeneration is a better approach for future cellular therapies. Besides being faster and more cost-efficient in the development of stem cell therapy treatments, this provides a new opportunity for use of iPSCs in disease modelling and personalized drug discovery that was not appreciated before."